It's been a long time I didn't give a tutorial about one of Google's products, the Google Play Store. As you probably already know that Google Play is the largest online store for Android users, where you can find a wide variety of digital content there. Well, sometimes that makes some new Android users have difficulty finding apps and games which will be released or newly released on Google Play. So for those of you who don't want to miss the latest updates from them, then you need to know this information. You can find out the latest Android games which will be released in 2019, 2020, and so on without having to read the news again. Enter the keywords on Google search "Upcoming Android Games on Google Play" or "Upcoming Google Play" for more simplicity. 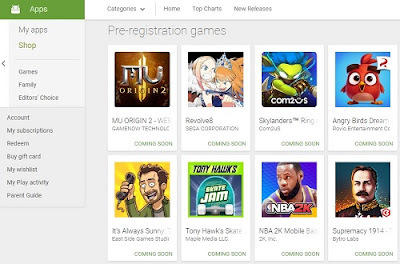 On the first page, click on the Pre-registration games article that leads to the official Google Play store page. Note: Articles that usually occupy the top position are not official Google Play pages, but famous sites like AndroidAuthority or AndroidPit. Next, there will be a display of several games that will be released on Google Play, as shown above. Tap one of the Android games you want. Tap the green "Pre-registration" to pre-register. There is a pop up saying that you're about to pre-register for "Game Name". We'll notify you when this game is available for your device. You will then get a notification when the game has been fully released on Google Play. In addition, you can also use the application called "PreLaunch.Me - Upcoming Games" to get information about the newest Android games that will be released in the future. On the home page, find the "New Game+ Updated" session. From there you will get information about some newly released and updated games on the Google Play Store. Tap "See More" to see more games in the session. Click "Apps" on the left side of the screen. Click "New Releases" on the right. From there you will get information about new games based on several categories, Top New Free Android Apps, Top New Paid Android Apps, Top New Free Games, Top New Paid Games. Click/tap "See More" to see more applications and games in these sessions. Top New Free Android Apps: Contains a collection of free Android apps and games. Top New Paid Games. Contains a collection of paid Android games. Enter the keywords "New Releases Android Games on Google Play or" New Releases Google Play" for more simplicity. On the first page, precisely at the top position, click/tap the article that leads to the official Google Play store page. Later, some games that have just been released on Google Play will be displayed. Please note that the "New released game" and "Updated game" are different. The new game means that it has just been released, whereas the updated game means that "possible" games have been released a long time ago, but there are new additional contents. So in the "New Game+ Updated" session, it's not only contained the games that are newly released, but also the old games that have just been updated again. How? It's easy, right? That's how to find the upcoming and new released Android games on Google Play without checking articles again, and again and again. If you still have any problem, let me know in the comment section below. Bully: Anniversary Edition was released on Android and iOS in 2016. But I don't know why I want to make the complete answers for Bully English classes right now. Although in fact, this is too late for the party. But because I'm a bit missed and wanted to nostalgia with the game, so I decided to make this article as my personal journal. Just like Rich Brian said in his new song "we got history". There might be people out there who still playing this game and need this guide as well. Bully English class is divided into several stages, the English class 1 to 5. To finish each class, you must assemble various letters and make them into English words. The answers below are used for Bully: Anniversary Edition Android and iOS, but you could use it on Bully PS2 and PS4 as well. Although there are some different answers and can not be used for them. But do not worry, though you can still finish all the English classes with some of these answers. Compose an English word as many as you can before the class ends from various letters "LWLMOE". Reward: You will earn the ability to apologize more effectively. Compose an English word as many as you can before the class ends from various letters "HGIFST". Answers: Gifts, Sight, This, Fit, Fig, His, Hits, Its, Sit, Sigh, Shift, Figs, Fish, Fist, Fits, Gift, Gist, Hits, Ifs, Sift, Fight, Fights. Reward: You will earn the ability to give better shove taunts. Compose an English word as many as you can before the class ends from various letters "IMSLSE". Answers: Slime, Smile, Miles, Slimes, Smiles, Elm, Lei, Lie, Mil, Elms, Slim, Mise, Semi, Isle, Leis, Less, Lies, Lime, Mess, Mile, Miss, Isles, Limes, Seism, Semis. Ism, Isms. Mils, Sims. Reward: You will earn the ability to apologize to prefects for small crimes. Compose an English word as many as you can before the class ends from various letters "YCORNA". Answers: Crayon, Crony, Corny, Rayon, Any, Arc, Can, Car, Cay, Con, Corn, Cory, Coy, Cry, Nay, Nor, Oar, Orca, Ran, Ray, Roc, Rya, Yon, Cran, Cyan, Narc, Racy, Roan, Yarn, Acorn, Carny, Crony. Reward: You will earn the ability to apologize to give better taunts. 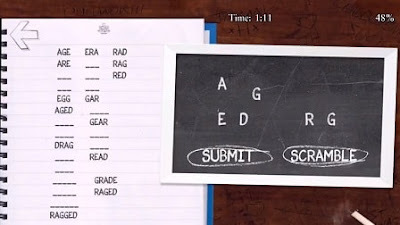 Compose an English word as many as you can before the class ends from various letters "AGDRGE". Reward: Apologize to police for small crimes and they will leave you alone. Note: words with _ means could only be used for bully PS2 and PS4. Maybe that's just a wiki guide that I could share on this article. Hopefully, this could be useful for those who need it. Thanks for reading this article. 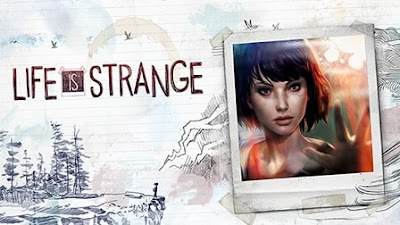 Life is Strange is a storytelling adventure video game with episodic graphic-style originally developed by Dontnod Entertainment and published by Square Enix. The game started its existence as a PC and Console game in 2015. The story is about Max Caulfield, an 18-year-old photography enthusiast who finds that she has an ability to reverse time at any time while rescuing her best friend, Chloe Prince. After predicting the huge storm that will occur, Max must take responsibility to prevent the destruction of her city. The player's actions will adjust the narrative as revealed and reshape after being allowed to go back in time. Taking quests and making environmental changes represent puzzle-breaking forms in addition to choosing varied options for conversation. At that time, many critics discovered that it offered one of the best interactive stories of its time, many of them give outstanding reviews. Maybe, that was the reason why Square Enix brought it on the iOS in 2017. For Android itself was planned to be released by Square Enix Ltd in Summer 2018. That's right, Android is no longer underestimated in the gaming industry. Last month, I did a pre-registration of this game on Google Play. And today, July 19th, I got a notification that Life is Strange has been released on Android via the Google Play Store. This game has five episodes available. The first chapter of this game is completely free to play, but for the next chapters, it requires you to buy. You can buy each of the 4 chapters available separately. The second round is offered a discount of $ 0.99, but chapters 3-5 are $ 4.99 per item. You also have the option to buy everything at once for $ 8.99, which is a better deal. Recommended smartphones require a fairly high specification. You must run it on Android 6.0 (Marshmallow) or higher, and your smartphone must support OpenGL 3.1. You will also need devices with a 64 bit ARM processor, and a minimum of 2 GB of RAM. Devices with lower end specifications may be able to install and boot the game, but their performance may not be great (slightly lag). As explained in the description, a low-end device may have technical issues, causing a bad experience, or does not even support the game at all. If you can't find Life is Strange app on the Google Play Store, it's a sign that your Android device doesn't support to play the game. The Pokemon Go Community Day is a routine in-game event held once a month designed to invite players to go outside and play together at a certain time. Every limited event will offer featured Pokemon with unique and exclusive movesets that will appear for three hours, plus bonuses, like a double XP, Stardust, or Lure Module, as an attraction to Trainers to come out and play together. Niantic as the developer hopes this regular event will add "the excitement of local events and meetings", suggesting the right moment to gather your friends at this set time. 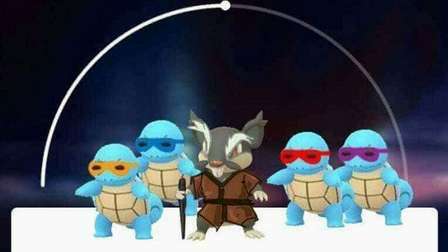 The last Pokemon Go Community Day was held on Sunday, July 8th, featuring Squirtle as the exclusive Pokemon. 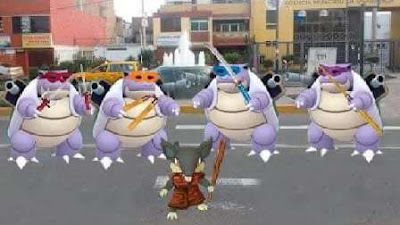 As you probably know, Squirtle's ultimate evolution Blastoise is a water-type Pokemon that is quite effective to use against Fire-type Pokemon, Charizard for example. 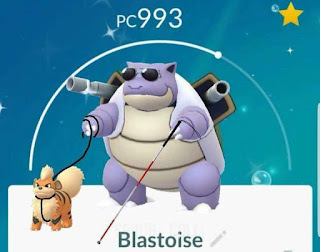 In Pokemon GO community Day, there are interesting extras where you can catch Squirtle - Wartortle - Blastoise wearing sunglasses (Squirtle Squad) based on the anime. Surely you must complete the Field Research quest first to get them. But we will not discuss how strong they are or a deeper explanation to get them, here we will show other interesting things about them. The Pokemon Go Community Day excitement may indeed have ended, but it does bring up the creative ideas of the Pokemon Trainers. 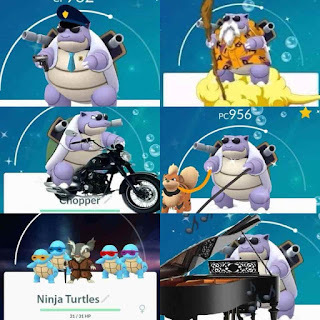 Here are the top funny photos of sunglasses-wearing Squirtle and Blastoise from the Community Day event that have been edited by some creative trainers of the Pokemon Go Worldwide Community. This is when they were kids. They're still in training under their master! When they have grown up. Creative, right? there are Leonardo, Donatello, Michelangelo, Raphael and their master, Splinter. They have dared to go down to the streets, ready to quell the evil! Walk with Growlithe, he's so cute! Watch out of his "Kamehameha" (Hydro Pump/Hydro cannon)! How? That's cool, right? 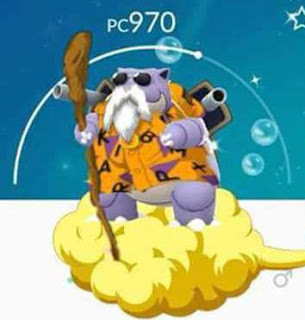 If there are things like this, it makes people entertain so it might attract more people to play Pokemon Go again. Special thanks to all trainers who edited these pictures. It will be held on Saturday, August 11th and Sunday, August 12th. 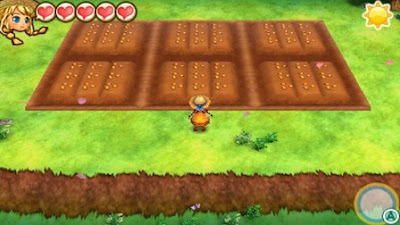 Lumber is one of the materials needed if you want to upgrade buildings in Harvest Moon: Hero of Leaf Valley. Lumber can be obtained through two ways; part-time job to Woody and horse race betting. The first time you work to cut down the trees for Woody, you will not immediately get a lumber, but only money as a wage. However, after working more than 5 times, he will ask you to keep the lumber you get from work. When you're rich, you can also give Woody a Golden Egg to make him take you to his secret logging area. 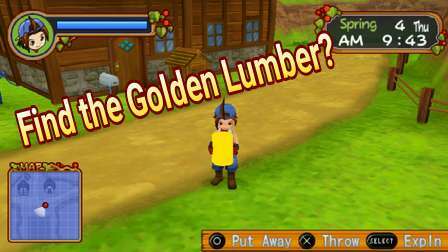 To get a regular lumber is fairly easy, but what if it's a gold lumber? There is a rumor that we can get a gold lumber in the game. This rumor used to be often discussed in a forum like GameFAQs. Some members of the website said that this rumor was true. One of them was Clara_lin who was an expert in the game. However, there were also many people who still didn't believe in the existence of this gold lumber because there was no solid proof (no SS or anything on the internet). So it's up to you to believe to this article or not. We only provide the information because of the request of some players and of course this is based on what we have read from GameFAQs. You've saved the village from the Funland company. It also successfully completed all 16 event endings. Don't cut down the trees on Woody's logging area for approximately 5-10 Years. After year 4, don't ever cut the tree there. You've got and completed all the rare items in the storage room. Harvest Goddess' FP must be at least 5-6 hearts. You have Lunar Stone and Moonlight Stone. So after successfully saving the village and past the 4th year, never cut down the trees on Woody's logging area. On Winter 25th-30th, Year 15, when you visit Woody's Timber area, there will be a scene about the strange and enormous tree that grows on the area. The tree is very big and made of Gold, very different from the usual tree you cut to get the lumber. The regular Axe will not be able to cut down the tree, because your stamina will run out before the tree falls. Therefore, you need to upgrade your tools, especially Axe, into Divine/Blessed Tools first. To upgrade, you need the help of Harvest Goddess and prepare it from the previous years. In Year 12, on any day, go to the mine, there will be a scene where Rudolf sees a treasure chest (the Sunken Treasure) that can not be opened. He recalled that the hammer you used to defeat Mecha Mole could be the key to unlocking the treasure chest. From it, you will get Lunar Stone. Now you can also open the treasure chest you got from fishing. When you get the chest, there will be the words "open the treasure", and there is a "yes" option if you want to open it. In Year 15, bring the Lunar Stone and Moonlight Stone to the Harvest Goddess and she will make you Blessed/Divine Tools. Of course, you've seen the golden tree event before. After that, you can cut down the golden tree in Woody's logging area to get the Golden Lumber. This Golden Lumber can later be used as a material to upgrade your house for the last time. So as to make your house become storied and bigger. However, some furniture will be moved from its original position. That's the Rumor of the Golden Lumber and Blessed Tools in Harvest Moon: Hero of Leaf Valley, apart from it's actually true or not, would you want to play the game until 15 years just to find the Golden Lumber? If you already own the Season Pass, you need to include the new DLC on a Nintendo Switch, save the game and close the software, then press the plus button, and choose "Update Software". For PS4, it's actually the same. You just need to download the DLC from PlayStation Store. Same as if you want to unlock Shirlock and Michelle. After downloading the DLC, you will get an event where Melanie tells you about the grand opening of her new shop in the mountains. Meanwhile, Doc is trying to invent a device that can change the looks of a room in a flash. To trigger the scenes described above, I think it relates to the main storyline. If you'are done with it, you will get the scenes immediately. Reward: Seasonal outfits for the main and marriageable characters. There are a total of 42 new outfits! Outfits for the main characters: 3 x 2 = 6 + for Bachelors: 3 seasons x 6 people = 18 + for bachelorettes: 3 seasons x 6 people = 18, so 42 new outfits. Soleil, Gorgan, or Harvest Goddess doesn't include. Reward: You can change your house room with 7 unique interiors! Here are the details of them. Doc not only provides your house upgrades and decorates your farm, he now can also change the interior of your house! Description: A pixel art-style Insta-Room. A nostalgic trip down 20 years of history. Now you have the ability to change your house interiors into pixel art-style like Harvest Moon: Back to Nature and Friend of Mineral Town. Description: An Insta-Room with pastel colors and colorful flowers. Recommended for those who want to raise the spirits. Description: A vision of the future can be seen in this Insta-Room. Truly breathtaking. 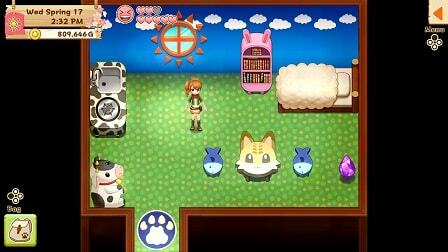 Description: An Insta-Room with furniture of cute animals. Gives you a fluffy feeling. Description: An magic-inspired Insta-Room recommended for magic lovers. It doesn't actually help you use magic, though. Description: An Insta-Room based on the Eastern-Style house. The cat will surely bring you luck. Description: A Steampunk-style Insta-Room recommended for those with quirky taste. 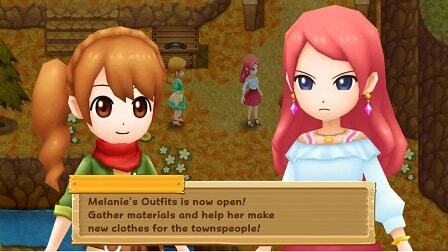 Gather materials and help her make new clothes for the townspeople! Description: Men's outfit perfect for the hot summer. Material needed: Donkey Fur 4x, Great Wool 2x, White Dahlia 4x. Description: Men's outfit that fills the foliage of fall. Material needed: Cotton Candy Wool 4x, Great Donkey Fur 2x, Pink Carnation 2x. Description: Men's outfit perfect for the cool winter. Material needed: Silky Fur 4x, Great Cotton Candy Wool 2x, Purple Pansy 4x. Description: Women's outfit perfect for the hot summer. Material needed: Cotton Candy Wool 4x, Great Wool 2x, Red Rose 2x. Description: Women's outfit that fills the foliage of fall. Material needed: Donkey Fur 4x, Great Cotton Candy Wool 2x, White Rose 2x. Description: Women's outfit perfect for the cool winter. Material needed: Silky Fur 4x, Great Donkey Fur 2x, Blue Rose 4x. Once you buy these outfits you'll get a scene where the bachelors or bachelorettes thanks Melanie for the new clothes. They will also change their clothes according to your season now. Note: Spring outfit is the default one. These unlock after you help Melanie and complete her requests. You can change your clothes via a dresser at home or the main menu before you enter the game. 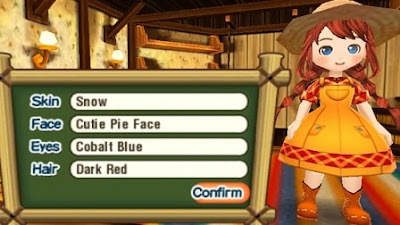 Previous post: Can I Change Clothes in Harvest Moon: Light of Hope for PS4 and Switch?